In this class we will take a look at traditional calligraphy scripts and how to expand into more modern styles. You will walk away with knowledge on using the unique tools involved in dip pen calligraphy, traditional and modern lettering styles, paper and ink choices and more! This class will be a one day workshop from 9am-1pm. You can chose between Saturday or Sunday’s class when you register. We will explore how to use different nibs, pen holders, guidelines, ink and paper. 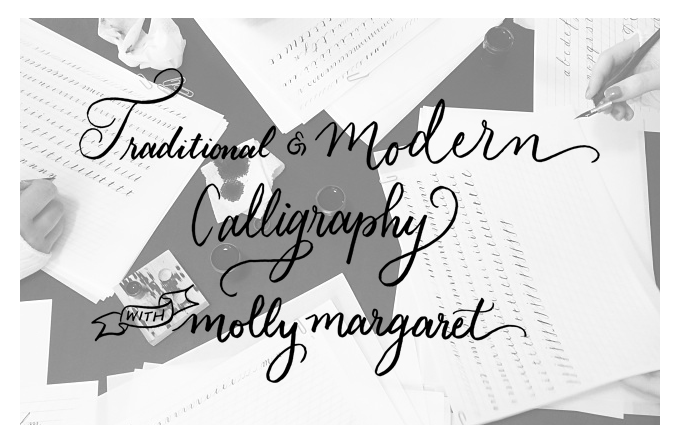 The first part of class will be focused on traditional copperplate letterforms. It’s important to understand the foundations when learning a new skill. This part will give you an understanding of the main concepts of calligraphy. In the second part we will look at how to expand your skills. We will dive into a more modern calligraphy styles, learn more about paper selection and go over any other questions! My goal is to help you begin a journey in calligraphy. I’ll take time with each student to provide you with techniques and tips to further your skills. I will provide you with paper and ink. Join the mailing list for class updates and more! April 2016 Nashville Brush Lettering and Calligraphy Class Now Open! January 2016 Calligraphy Classes Open!